For visitors' information, go to Lightouse Museum. 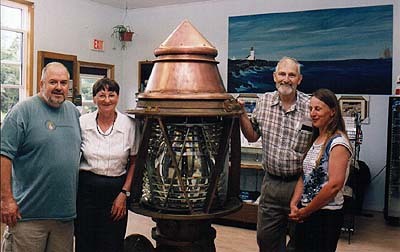 August 2, 2003 marked an important day for the preservation of Nova Scotia’s rich lighthouse history, with the official opening of the Out of the Fog Museum, our province’s first museum dedicated to the display of lighthouse artifacts. The occasion was well-attended by local politicians, media, former lightkeepers and their families, lighthouse enthusiasts, and many local residents, including a trawler captain who has been well-served by lighthouses over the years. This museum is situated on the Northern Mainland of Nova Scotia, on Chedabucto Bay, near Queensport. There is indeed much to see at this museum! 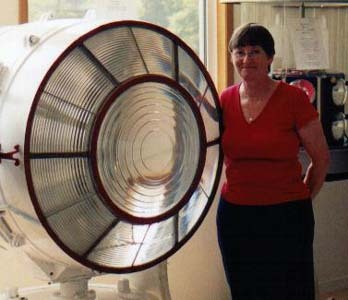 The range of items covers more than a century of lighthouse technology and includes an impressive selection of Fresnel lenses, fog horns (hand horns, large Airchimes and diaphones), fog detectors, catoptric (reflector) apparatus, DCB 10 and DCB 36 rotating beacons, and buoy lanterns ranging from compact 150 mm models, to the massive 500 mm AGA gas lantern. Several newer-style lenses are on display as well, giving visitors a good sense of how much technology has changed the traditional aids to navigation. The Keepers of the Beacons have given the museum a personal feel with a display of period clothing, lightkeepers’ log books, personal items donated by former lightkeepers, and my favourite – a home-made school desk used by John Curtis MacQuarrie when he lived on White Head Island with his lightkeeping parents John and Gloria. Included in this display is an audio tape of a very young John Curtis doing his lessons, with the sound of the fog horn in the background. Such was life for a lightkeeping family before total automation in the 1980s. The Out of the Fog museum opening was an important day for lighthouse preservation, but it was equally as important for the people who put it all together. This small, dedicated group of volunteers worked hard. It was no small job to round up the artefacts necessary to put a museum together. Volunteers wrote letters, made many calls, wrote letters and placed ads in newspapers. Slowly, things started to happen and the Keepers received donations from across the country, south of the border and from down the road. The largest single donation came from the Canadian Coast Guard College in Sydney. They answered the call with a wide variety of artefacts that had been in storage for many years. These items are now proudly displayed along with a thank you plaque which was presented on opening day. It is heartening to see the Coast Guard’s support of a venture such as this. Keepers of the Beacons and all who helped make this museum a reality can very proud of their success. The collection preserves an important group of lighthouse artifacts and is a dispaly that can be seen nowhere else in Nova Scotia. The NSLPS sees this as an excellent example of what a group of volunteers can do when given help and encouragement. We also applaud the support of municipal and provincial governments. We wish the Keepers of the Beacons every success. The Out of the Fog Museum is located at Half Island Cove, along highway 16, near Queensport, between Guysborough and Canso. Structure Type: Former schoolhouse converted into lighthouse museum with a collection of lenses etc. Located on Highway 316 in Halfway Cove, near Queensport.